The simplest answer to the question of why I sail is that something deep inside of me is drawn to the wind and the water with the intensity of a double-reefed beat to windward in lumpy seas on a cold and wet Lake Michigan morning. But I have to admit there’s much more to it than that. It’s not just a deep desire to fulfill the yearning inside that keeps me sailing. In an age where consumerism tries to convince us that faster is better and that life is easier lived through our laptops and iPhones, it may seem odd to non-sailors why some of us take to the water in something crassly powered by wind. In fact, maybe it’s not even obvious to those of us who are sailors. Sailors from years ago had an obvious reason to sail. They needed to cross oceans and sailing provided the only means. But steamships brought a new means. In the business of claiming new lands and transporting valuable goods, time is money and steam power equaled speed when compared to a square-rigger wallowing in the doldrums. Yet while switching to steamships made some men rich, others still today chase priceless treasure with the wind filling their canvas and their spirits. Money may be one reason why some mariners no longer sail but the “free”dom of sail helps explain part of my own infatuation with sailing. A cruising sailor who patiently relishes the adventure of the journey can circumnavigate the world on a very modest boat and budget without much need for speed. In addition to providing a relatively affordable way to see the world, sailing is also addictive. There's something about riding the wind and the waves that makes the destination matter very little, but the journey matter a whole lot. Maybe it has something to do with the way sailing makes you slow down and breathe in the world around you. Out there on the blue there's no internet, no cell phones, no bad reality television, no dramatic news headlines, no hands racing around the numbers on some clock on the wall. There's only the wind, waves and your dreams. Last summer on my most ambitious cruise to date I made a major deposit in my memory bank, but it turns out that only halfway through the off-season I had greedily overdrawn my account. Like a hungry Wall Street broker, I can’t seem to ever have enough in my memory bank account, but sailing helps me make the biggest deposits. 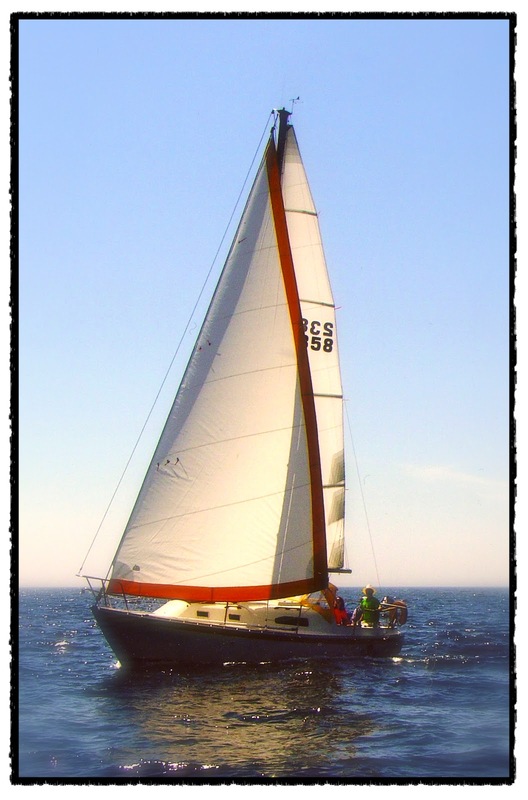 While on a family cruise of over 1,000 nautical miles in Lake Huron’s North Channel for the better part of last summer my understanding of why I sail increased and developed immensely. We spent most nights secluded at anchor, but of course occasionally had to come in to port to provision. As lovely and quaint as some of the North Channel ports are, there wasn’t much to keep us there for very long. Even if the local marinas had all the amenities of our home marina (pool, showers, playground, electricity, etc. 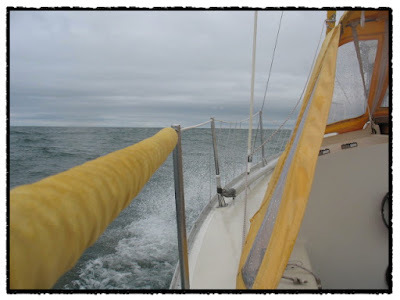 ), the weather was the only thing that kept us in port beyond time needed to refill the icebox and food bin. We grew quite fond of life on the hook among the islands of the North Channel. Again I was reminded that there’s just something freeing about being unplugged from the electricity, sounds, smells and sights of civilization. At anchor and on passage you learn what you really need and you learn how to get it. More importantly you learn what you don’t need and you live without it. Life as a serious cruising sailor is just that simple. I’m not trying to suggest that sailing offers freedom from responsibility. Oh no, that kind of freedom is definitely not offered. There’s plenty of responsibility required to live the cruising life. Among the many responsibilities of a cruising sailor are keeping the crew and vessel safe, maintaining morale, watching and interpreting the weather and a whole host of other necessities. I am, however, suggesting that sailing can offer freedom from the flaws and pressures of society. You are who you are when you sail and not what society expects you to be. In fact, I believe sailing actually makes you more of who you are. If you’re someone who is obsessed with technology while on land, you’ll be even more so when you immerse yourself in the acronym soup of technology available to sailors (AIS, GPS, VHF, SSB, etc.). If on land you’re someone who needs close connection with friends and family, you’ll find yourself either sailing with or longing for them when at sea. The rigors, challenges and rewards found aboard a sailing vessel intensify your core being. Still, there are those atypical times after a long, hard passage or after many consecutive nights spent at anchor that my mind begins to betray my sailor’s soul and I catch myself thinking about how nice it would be to tread on solid ground. Luckily once on land my thoughts make a quick tack and I find myself craving the motion of the boat, the smell of the watery air and the wind whooshing across my sails. So I admit there are rare occasions when I think about the land while on the water, but conversely there’s almost no time ashore when I’m not thinking about sailing again. I’m convinced that a sailor needs the perspective gained from the contrast of the land and sea just as every sunset needs the dawn to form the next day. The contrast makes it all flow and helps to further answer the question of why I sail. But alas, don’t think sailing doesn’t come with hardships and that cruising is just palm trees and martinis and time spent splish-splashing the days away in the tropics. I’ve mentioned a lot to like about sailing, a lot to be inspired by, but it all comes neatly packaged with serious trade-offs. If you don’t know it already, you’ll find sailing also includes storms, shoals, reefs, freighters to dodge, big waves, exhaustion, never-ending maintenance, repairs, loneliness, and any number of other challenges. Fortunately, the unforgettably good experiences, wonderful sights, interesting people and personal growth that comes from living and traveling on a small sailboat as a family in a seemingly far away place easily outweighed those challenges for me personally. I remember not so long ago when I was afraid to fly our symmetrical spinnaker simply because I never had before. Well that, and because it’s a lot of canvas and horsepower dangling un-tacked in front of the bow and the word that scares a lot of sailors was in the front of my mind (“Broach!”). Now after finding the courage to hoist that big, beautiful sail I’m blessed with the knowledge that trying should precede saying “I can’t”. Sailing has confirmed for me that whether you think you can or you think you can’t, you’re correct! So that’s it, right? 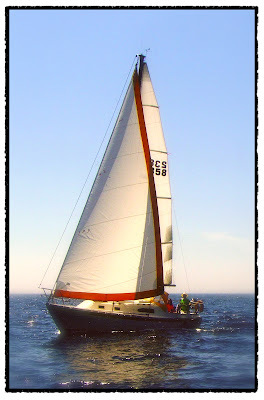 I sail because I find personal reward in rising to the challenges. Yes, that’s another piece to the puzzle, but there’s still more. Sailing gives me a deep sense of adventure and self-sufficiency, even if I don’t always capitalize on that feeling. I grew up near Lake Michigan and still keep my sailboat in the powerboat-centric port of Grand Haven on the big lake’s eastern shore. I’m comforted knowing that the world is literally just a toss of the docklines away. I haven’t done it yet, but I could make my way out through the Erie Canal or St. Lawrence River and then have just about any port on the globe available as a waypoint on a course around our watery world. There’s real adventure, power and freedom in that thought. Perhaps only an airplane pilot can know the same feeling, though they can’t possibly be as self-sufficient with their need for fuel, airports and much shorter periods away from civilization. Serious cruising (or racing in an event like the Vendee Globe) on a sailboat requires and rewards self-sufficiency. Cruising many miles from land on a sailboat, you have nothing except the wind, the waves and that which you brought onboard. Good offshore, bluewater sailors know that they must be competent in many skills. On a long passage you need to be your own mechanic, navigator, doctor, chef and any number of other professions. I very much like the idea of being able to survive in harmony with the water and my fiberglass ticket to adventure. I also cherish the dreams I have about the wind carrying me to far away places and my sailboat serving as home. Self-sufficiency is simple and complex at the same time and again the contrast seems to be what I find so fulfilling. So what does it all mean? Inner yearnings, freedom, contrasts, challenges and rewards all sound like good, if a bit idyllic, explanations as to why I sail. Sailing is helping me to discover myself. I’m finding I have talents I didn’t know I had and talents I didn’t think I had a use for. But the best answer of all may be that sailing keeps me searching for new answers. And as I sail and search like iconic explorers from hundreds of years ago, I continue to find. We all have reasons on why we sail. It's very satisfying to fulfill those reasons. I agree that sailing can help a person discover who he truly is. There are things about sailing that's indescribable and the only way to know is to experience it yourself. Parts of the world were discovered years ago but those who sail today will still find something new within themselves. This is a great post. I can truly relate to this.